NNC started with these three challenges, a few weaving machines and an overwhelming desire to do something to assist those with disabilities. Through the introduction of a friend working for the Binh Dinh Newspaper, the Department of Labor & War Invalid Society made a small store front room available. This helped to solve the “First Challenge”. In July 1993, the first free vocational training class for Wool Knitting and Embroidery was opened with 20 disabled students. 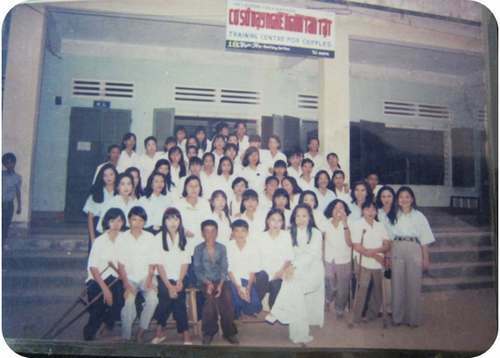 In October 1993, with the help from the Binh Dinh Television Station, they introduced the opening of the first store selling products made by the handicapped in Binh Dinh. How to maintain NNC’s operation? NNC Attended Trade Exhibitions throughout the country displaying and selling the products made with Binh Dinh ethnic fabric material. This slowly helped to provide employment for many disabled students and their teachers. This basically solved the “Third Challenge.” Since then, a lot of popular products based on local and traditional handicrafts are produced and sold.